The event was played in a best-of-five Conquest format with one ban. First, the 77 players went through seven rounds of Swiss to determine the top-8 cut for single-elimination playoffs. After those seven rounds, Pavel was the #1 seed as the only undefeated player. Four players finished with a 6-1 record, and 10 finished at 5-2, so tiebreakers were needed. Three players made it in to the top-8 through tiebreakers: Orange, Ronnie, and Hunterace. As an interesting sidenote, Ostkaka dropped out of the tournament at 4-2, but with the way the final round turned out, he could have actually made it into the top-8 with a win. Of course, had he not dropped out, the pairings for the final round would have been different, so everything could have ended up differently. Dropping out affects your own chances, but also the fate of others. The tournaments was a bit lacking in incentives: top-4 finish was everything, as that qualified the player to the global Summer Championships, but semi-finals and finals had no real incentives. Multiple players commented about their lack of focus after ensuring that top-4 finish: all the pressure was off and it had been two long days, so the quality of play did not necessarily improve towards the end. 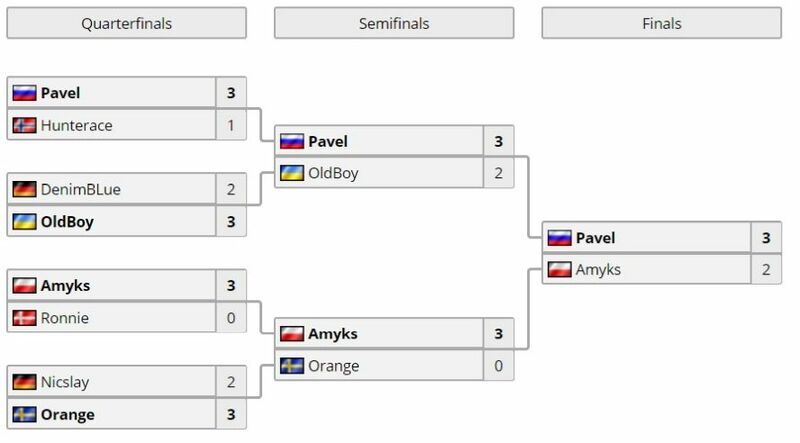 Europe’s representatives for the Summer Championships 2017 are Pavel, OldBoy, Amyks, and Orange. Pavel put up a stellar performance once again, winning yet another title. Blizzard sends out the decklists of the event to players and selected media sources, which usually publish some of them. This time, all of the decks were published by multiple sources, for example this one here. Druid: 77 – every single player brought Druid! Druid and Priest were the dominant forces of the tournament. Druid ate almost all of the bans, and with that out of the way, Kazakus Priest just rolled over the competition. Every player who reached top-8 brought Jade Druid and Kazakus Priest. Differences were made in the other two decks that players chose to bring. Warrior, Paladin, and Mage were the most successful classes behind the top duo, as only one player in the top-8 brought something else: Pavel was the only representative of both Shaman and Warlock in the top-8. Jade Druid and Kazakus Priest are the kings: Jade Druid without playing a game and Kazakus Priest by rolling over the opposition. But what about the other spots? Taunt Warrior performed admirably: there were 14 Taunt Warriors in the tournament, and four of them made it to the top-8. It turned out to be a great meta read for this tournament. Amyks’s Taunt Warrior with its 9-2 record was one of the best-performing decks in the entire tournament. Some Murloc Paladins and Pirate Warrior slipped into the top spots, but overall those archetypes underperformed: both came to the tournament with 30 representatives, and only two of each made it to the top-8. Compared to Murloc Paladin, Control Paladin did really well: there were only nine in the entire tournament, and two of them made it to the top-8 with a third one missing out on tiebreakers. A control lineup proved to be a viable choice this time. Mage had decent performance: 34 in the tournament, four in the top-8, slightly increasing in representation. Freeze Mage did better than Control Mage this time, with the top-8 spots three to one in favor of Freeze Mage. Evolve Shaman was the third-most popular deck to bring to the tournament at 36 representatives, but only one of them made it to the top-8. To be fair to the archetype, two other Evolve Shamans missed out on the top-8 spot on tiebreakers. Still, it performed significantly below average. Hunter and Rogue were almost extinct with only five Rogues and three Hunters in the entire tournament. None of them made it to the top-8, and none of them even made it to the top-16. Rough time for those classes. Even Warlock did better, with one Warlock out of nine reaching the top-8 and another Warlock narrowly missing it on tiebreakers. The near-universal Jade Druid bans made it impossible to determine the strength of the variations of the deck. Just put in Ultimate Infestation, ramp, and Jade cards, I guess. The nuances of running Kun the Forgotten King, Medivh the Guardian, Gadgetzan Auctioneer, Yogg-Saron, or Arcane Giants played no part in this tournament. However, the Jade Druid issue goes deeper than that. Tournament meta and ladder meta have never been further apart. With the absolute dominance of Druid on the ladder, every ladder deck needs to tech against it and ones that cannot do so effectively enough are dead. It is a serious issue for the game when ladder and tournament play start drifting apart. Ban decisions are gone. You ban Druid. That’s it. No more using game theory to see what actually gives you the best chance to win. No more percentages. No more theorycrafting. Best of five with one ban is effectively best of five, eight classes. There are no bans anymore. There is no way to make lineup choices with specific bans in mind. Druid has 100% participation and 100% ban rate. That is beyond absurd. All of the above contribute to what is likely the most boring tournament meta ever this early in an expansion. Blizzard will need to act rapidly on this one, this is like nothing before. Obviously players play in the environment they are given, but this situation is unprecedented and grave. What is a Freeze Mage, what is a Control Mage? It can be a bit difficult to distinguish between Freeze Mage and Control Mage right now. There is some considerable hybridization going on and different people tend to categorize the decks differently. What I’m typically looking for in Freeze Mage is the presence of Archmage Antonidas and Pyroblast, abundance of burn, draw, and stall, and lack of sustainable minion presence. Control Mage, on the other hand, often includes cards such as Polymorph and Firelands Portal, lacks card draw compared to Freeze Mage, and is able to generate more sustainable pressure while still being able to burst with direct damage when the draws happen to go that way. There are several cards that would not have been in Freeze Mage decks some time ago, but that currently do not really tell you much. Cards such as Mana Wyrm and Gluttonous Ooze see play in Freeze Mage decks as well as Control Mage decks. Likewise, the presence of Doomsayer, Frost Nova, Blizzard, and Alexstrasza do not tell you anything about the archetype, as those are present in all Freeze Mage and Control Mage builds anyway. Even Frost Lich Jaina is not a sure sign of Control Mage. There are some builds out there that are complete Freeze Mage lists and then include Frost Lich Jaina as well. I would hesitate to call them Control Mages, as they have no other minion presence. Most of the Freeze Mage lists do not include Frost Lich Jaina though, whereas all Control Mage builds do. In practice, the difference between the two is mostly in their reliance on burn. Freeze Mage wins with damage spells. Many Control Mage lists can also win through minions or fatigue, but do not cycle through their deck nearly as effectively. In a way, this is not the best of times to highlight tournament decks for general use. With Druid dominant on ladder and universally banned in tournaments, these decks exist for a meta that is nothing like what people encounter daily on the ladder. Nonetheless, bits and pieces of them have to be right, because they work against other classes than Druid. Keep in mind that whatever you find here, it might need further tweaks to bring to the Druid-infested ladder, or it might even be completely unviable there. The most successful archetype that actually saw play was Kazakus Priest. The power of Shadowreaper Anduin when combined with Raza the Chained is undeniable. We got to see time and again how finding both cards early enables you to simply roll over the opponent whereas finding them late makes the game more even, but still not impossible for the Priest. For example, Pavel went 10-3 in the tournament with this list. It was remarkable how many differences there were in the Kazakus Priest decks that players brought, and yet how consistent each of them was in overrunning opponents. The general core of card draw, removal, Shadowreaper Anduin, Raza the Chained, Kazakus, and Lyra the Sunshard is simply very powerful. The overall strategy of Kazakus Priest is to cycle to your Anduin and Raza and then machine gun the opponent down with your Hero Power from there. Priest can also choose to include a number of cards that generate additional resources or boost their damage output. Lyra the Sunshard is obviously staple, but if you’re looking at going into a control, and possibly fatigue, matchup, having a few extra cards can help find the damage needed. OldBoy was the only one who chose to bring the full Prophet Velen + Mirage Caller + Burgly Bully combo. Prophet Velen and Mirage Caller allows the Priest to deal 14 damage, and any coins or zero-mana spells add another 8 on top of that each. Prophet Velen alone has a similar effect with some cheap spells: 14 damage comes from Velen and two spells. The power of Mirage Caller is only realized if you have any spells to play on top of it, as two spells already bring the total damage to 30. It is notable that three of the four semi-finalists included Prophet Velen in their Kazakus Priest decks. The card showed its effectiveness time and again, and seems to be a great addition to the Kazakus Priest core. Perhaps the biggest surprise in the tournament was the comeback of Taunt Warrior. It was not brought by many players, but half of the players in top-8 had one in their lineup. Sitting behind an army of taunts and shooting big fireballs with your Hero Power remains a winning strategy, especially when you ban Jade Druid so you do not have to worry about that matchup at all. How did players tech their Taunt Warrior decks? First of all, none of them had Skulking Geist. With Jade Druid banned, there is no need. Therefore, the effectiveness of these decks for ladder play is questionable at best. Amyks chose to go with two copies of Dirty Rat and a Forge of Souls for card draw as there are four weapons in the deck (12 Taunt minions). He therefore played more new cards than any other Taunt Warrior player in his deck with both Forge of Souls and The Lich King finding spots. That’s two new cards! Amyks went 9-2 with the list in the tournament, so it also performed extremely well. DenimBlue7 had one copy of Battle Rage, two copies of Dirty Rat, and a Shield Block (13 Taunt minions). Nicslay had one copy of Battle Rage and one Shield Block for some additional cycle and armor (13 Taunt minions). OldBoy had a bit of a different take with one copy of Whirlwind, Harrison Jones, and Deathwing (11 Taunt minions, the only one without Lich King and with Bloodhoof Brave). Control Paladin is typically low on threats and high on removal, and Amyks’s list is no exception. Not all Control Paladin lists run the new Hero card, Uther of the Ebon Blade, but Amyks had chosen to include that for some additional damage and healing. The list is teched against aggressive decks with two copies of Golakka Crawler taking up some space. Note that without a Skulking Geist, a slow deck such as this can struggle against Jade Druid on ladder. It is impossible not to feature the only Warlock deck in the top-8, Pavel’s Handlock. Despite making it to the top-8 though, Handlock was not a star performer in Pavel’s lineup. It featured extensively on stream, but with a 10-7 overall record in the tournament it was nowhere near a dominant force – in fact, it was the weakest deck in Pavel’s lineup. Furthermore, with no Skulking Geist in the build, this is not a deck you want to challenge Jade Druid with. Between Skulking Geist and Bloodreaver Gul’Dan, Handlock can sometimes fatigue a Jade Druid, but without the Geist the matchup is even worse. Pavel was banning Druid all along, so he did not need to consider this and could tech the deck for other matchups. The build is archetypal Handlock: two copies of Twilight Drake and Mountain Giant alongside one Faceless Shambler provide the muscle, and there is also an effective Bloodreaver Gul’dan package: two copies each of Voidwalker, Despicable Dreadlord, and Abyssal Enforcer. The deck is especially good against token-heavy board-centric decks, as Defile + Tainted Zealot, Hellfire, Doomsayer, Despicable Dreadlord, and Abyssal Enforcer can remove a lot of tokens. Thanks to Siphon Soul, there is also an answer to big individual minions, such as Bittertide Hydra. Pavel’s other deck, in addition to the mandatory Jade Druid and Kazakus Priest, was also unique in the top-8. This is fairly surprising, as it is none other than Evolve Shaman, a well-known powerful deck. 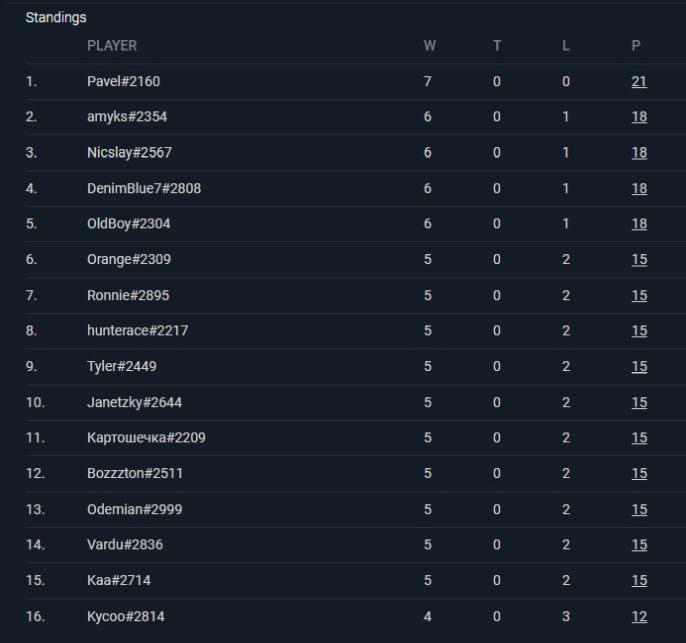 What is even more surprising is that there were actually 36 people who brought Evolve Shaman to the tournament, but only Pavel made it to the top-8. In all fairness to the archetype, Janetzky and Vardu came close, as both of them also had Evolve Shaman in their lineup, and both of them missed out on top-8 on tiebreakers at 5-2. Therefore, the overall performance of the archetype was not quite as bleak as it would seem at first sight. Pavel’s list is quite a standard one. It is the good old Journey to Un’Goro list with two changes: Stonehill Defenders have been cut to make room for Thrall, Deathseer and one copy of Saronite Chain Gang. Double Devolve, double Bloodlust, double Doppelgangster, it’s all still there. The deck also plays almost exactly like it did in the previous meta: first you go in with tokens and depending on the matchup and situation you either Evolve your tokens or you look for a swing turn with a big Evolve combo with Doppelgangster later on. Bloodlust is a constant threat that you can use with any wide board to look for lethal or simply put your opponent to a position that they cannot recover from. In late Journey to Un’Goro meta, there were lots of Sea Giants around and one copy of Devolve was often cut. Now people are not teching so hard for the mirror match and with the abundance of taunts and buffs in the meta, Devolve is stronger than ever, so the core of the deck has returned towards its original state. If, for some reason, you do not want to or cannot play with any new cards, your deck of choice is Freeze Mage. There are a couple of cards from Journey to Un’Goro in the list, so you cannot completely avoid Year of the Mammoth, but at least you do not have to touch Knights of the Frozen Throne. The deck works exactly like before: you draw, you stall, you Alexstrasza, you burn. OK, there are some more nuances to it than this, such as using Archmage Antonidas for burn generation and using Alexstrasza on your own face against aggro or just to play around Eye for an Eye. Still, it’s 100% guaranteed fun and interactive in an environment free of Jade Druids. Performance on ladder, on the other hand, is not guaranteed at all. OldBoy made the deepest run with Control Mage. While there are many similarities between Control Mage and Freeze Mage, mostly the abundance of freeze effects both decks run, there are significant differences as well. Control Mage does not cycle through its deck like crazy, it sometimes even wants to take games into fatigue. Control Mage is also able to summon more minions to the board and has more damage in the deck overall than Freeze Mage. It combines stalling the game together with playing minions and sporting a respectable amount of burn for a multitude of win conditions and a large variety of options on how to approach each matchup. Bans: Pavel banned Jade Druid and Hunterace banned Jade Druid. Pavel 3 – Hunterace 1. Bans: DenimBlue7 banned Jade Druid and OldBoy banned Jade Druid. DenimBlue7 2 – OldBoy 3. Bans: Amyks banned Jade Druid and Ronnie banned Jade Druid. Amyks 3 – Ronnie 0. Bans: Nicslay banned Jade Druid and Orange banned Jade Druid. Nicslay 2 – Orange 3. Bans: Pavel banned Jade Druid and OldBoy banned Jade Druid. Pavel 3 – OldBoy 1. Bans: Amyks banned Jade Druid and Orange banned Jade Druid. Amyks 3 – Orange 0. Bans: Pavel banned Jade Druid and Amyks banned Jade Druid. Pavel 3 – Amyks 2.